This quote by Anais Nin is a favorite of mine. It speaks to me of taking risks to live and experience life fully, to believe in my creativity and allow it to flow. The book is covered with paste papers of my own design. 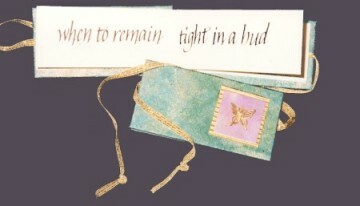 Arches Text Wove paper with methyl cellulose paste, powdered metallic pigments and Golden acrylics. Arches Text Wove text paper. The writing is done with sumi ink and a Hiro Tape nib. Book 2" x 4" (5cm x 10.1cm).